Cystic acne results from the bacterial infection of cysts deep within the skin. What exactly is a cyst? A cyst is a sac or space (commonly on the lower layer of the skin) that contains fluid or semisolid material. Cysts are large, inflamed acne lesions that are filled with pus. The contents of a clogged pore seep into the skin, and the immune system activates white blood cells at the location to fight the infection, causing the cyst to form beneath the skin’s surface. Acne cysts (unlike blackheads and whiteheads) are better treated with antibiotics. Without treatment, cystic acne may result in severe scarring and may cause considerable physical and psychological pain. Acne is so common that many people believe that it’s a normal part of human development and maturation. Nearly 100% of all adults will endure some type of acne breakout at some point. And a number of individuals will suffer from the severest forms of acne cystic acne and the possibility of permanent disfigurement as a result. According to medical practitioners, one of the most common reasons that young adults seek medical care is a strong concern about acne. Many of these young people have tried to self-treat with over-the-counter preparations and seek a physician’s help as an act of desperation when nothing else seems to work. Cystic acne is ugly. Aesthetically, having red lesions all over the skin causes a great deal of concern to any adolescent. Cases of severe cystic acne are sometimes physically unpleasant as well. 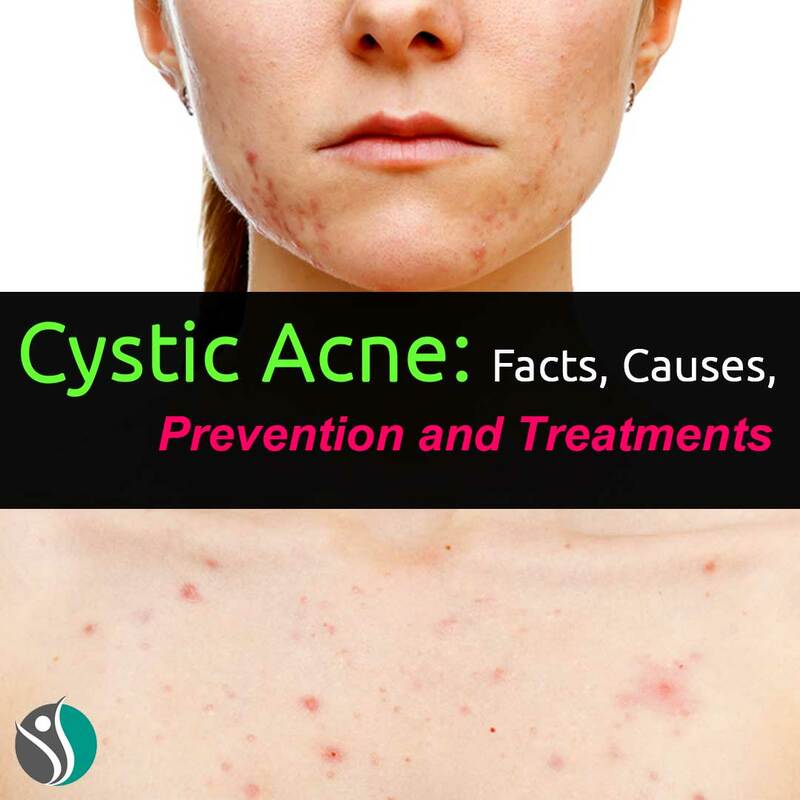 Severe cystic acne causes pain, recurrent bleeding and an unpleasant and foul-smelling discharge. While it rarely happens, some acne patients develop a severe toxic condition affecting the entire body and requiring treatment in a hospital. Needless to say, before the development of such powerful drugs as Accutane, such patients were extremely difficult to treat. Looking “different” can cause a great deal of distress in adolescents. People at the onset of puberty are sometimes in emotional states when they are probably least able to deal psychologically and socially with the unsightliness of active cystic acne. Adolescents experiencing cystic acne report more social isolation and self-consciousness than their peers not suffering from severe acne. Cystic acne can make a teen experience embarrassment, social inhibition, unhappiness, anxiety, and dissatisfaction with their facial appearance. Since acne occurs on the face in 99% of cases, it becomes inescapable and nearly impossible to conceal. Acne can reduce employment prospects and create interpersonal difficulties. Finally, acne scarring can cause devastating long term psychological trauma for the sufferer. Some researchers believe that acne scarring may be a risk factor for suicide, particularly in young men. A normal part of puberty? Perhaps. Acne in many degrees of severity from the single Whitehead the day of the prom to the heartbreak of cystic acne is very common not only in adolescents but in adults as well. Effective treatment can lessen the physical and psychological pain. Cysts are a form of acne that occur when the oil gland over-produces, then becomes clogged, then infected by bacteria. Unlike other types of acne, like blackheads or whiteheads, these skin lesions never release their waste products. Squeezing cystic acne may allow some discharge to occur. However, sufferers of cystic acne will discover that “popping” a cyst accomplishes absolutely nothing since the lesion will look the same within a short period after squeezing. Some people are simply prone to developing cysts. Some develop them when there is stress in their lives. Unfortunately, these cyst-like pimples that can last for months, and can range from mild to severe. For mild cases where a patient just has a few persistent cystic lesions, a physician or dermatologist will typically inject a steroid directly into the cyst to help shrink it. In addition to the injections, the doctor will probably prescribe the daily use of a topical retinoid such as Retin A. Retinoids can help to modify the skin chemically, making it less prone to these cystic type lesions. When cystic acne is severe it can be treated with Accutane, which can cure the condition. However, Accutane has many serious side effects so patients should carefully discuss the risks and benefits with their dermatologist before beginning any treatment cycle with this medication. Other types of topical medications generally don’t work with cysts. Besides the steroid injections and topical retinoids, the dermatologist may also introduce oral antibiotics in the treatment of cystic acne. Antibiotics can be helpful by decreasing the inflammation often associated with these lesions. One of the worst things anyone can do is to pick at a cyst. Squeezing a cyst breaks actually, breaks open the delicate hair follicle shaft where the infection originated. The breakdown of the follicle structure allows inflammatory contents to flood into the dermis and subcutaneous skin layers. The infection becomes much more widespread, and the area will look very red for weeks. In darker-skinned patients, squeezing a cyst will leave discoloration called hyperpigmentation. Lighter skin types don’t suffer the pigment problem quite as much, but permanent scars may disfigure the affected area for life. How can you tell that you have cystic acne? If you have deep infections on your skin that are nodules or cyst-like, and these infections don’t rise to the surface and discharge their waste material, you may suffer from cystic acne. You may or may not have blackheads or whiteheads along with the cystic nodules. But, certainly, these infections heal very slowly, with a risk of possible scarring. What’s behind these horrible bumps? Dead skin cells and other debris stick to the skin’s excess production of sebum and completely block the openings of hair follicles. Bacteria becomes trapped with skin oil and its free fatty acids within follicles. Unfortunately, these bacteria breed rapidly and tend to produce skin infections and abscesses. These severe breakouts are called cystic acne. Within the follicles, bacteria is not the only culprit. The reproduction of bacteria also generates enzymes that produce free fatty acids from sebum. These acids spill out into the follicle openings, inflame the skin and break down skin barriers such as calcium. In an effort to combat the inflammation, the skin near the follicle openings produces, even more, cells, which clogs the follicle openings even further. This action closes the follicles, making them ideal environments for incubating bacteria and producing acne infection. Some cystic acne sufferers are even fighting heredity. There is already a well-accepted theory suggesting that acne tends to run in families and that some people may be predisposed to cystic acne infection. A hypersensitive gene within the cells of the follicles responds with overproduction of cells within the follicle walls, causing chronic blockages. One of the ways you can combat the causes of cystic acne is to aim for effective bacterial control on the skin surface. However, killing and controlling the bacteria that cause cystic acne is not as easy as it was a few years ago. Overuse of antibiotics has allowed more resistant bacteria to develop; many are resistant to one or more of the antibiotics typically used to treat acne. Many people use glycolic acid in an attempt to fight acne breakouts. However, glycolic acid does not kill the bacteria that commonly cause breakouts. Salicylic acid and triclosan do. Benzyl peroxide kills acne bacteria, but it also dries out the skin and promotes premature aging. Typical acne infections rise to the skin’s surface and discharge a large portion of the waste products, toxins, and tissue debris. In cystic acne, this release does not happen. Helping the skin to absorb therapeutic chemicals becomes very important. Absolutely vital are drugs and topical medications that reinforce the skin’s ability to break down the infection’s waste materials and facilitate the healing and repair process. If this is not accomplished, cystic acne will not be controlled. Physicians and dermatologists commonly use antibiotics to treat moderate to severe cystic acne. Antibiotherapy attempts to eliminate the microorganisms that colonize the hair follicles. Oral antibiotics tend to work better than topical applications because they circulate throughout the body and go directly to the sebaceous glands and the rest of the skin. However, due to the overuse of antibiotics during recent years, some bacteria have developed resistance to specific antibiotics. When severe cystic acne fails to respond to other treatments, the dermatologist is likely to turn to Accutane. Accutane is synthetically produced vitamin A, taken by mouth. It acts by decreasing the formation of oily plugs of sebum (the substance secreted by the oil glands), reducing the formation of keratin (the tough outer layer of skin), and by shrinking the skin’s oil glands. Accutane is reserved for people with severe cystic acne that is unresponsive to other treatments. However, Accutane must be approached with caution. A dermatologist must perform a battery of blood tests, and women should not get pregnant while taking Accutane. It has been shown that Accutane while bringing considerable relief from cystic acne, may cause severe birth defects and miscarriage when a fetus is exposed to the drug. Women are cautioned to use two reliable forms of birth control for one month before treatment, throughout therapy, and for a full month after the course of treatment is over. Improvement of the cystic acne may not begin to show for up to two months after a person begins using Accutane. No known medicine can be added to speed up the process, and cystic acne has been known to grow worse before it gets better during about the first month of Accutane treatment. However, if one is willing to put up with the associated cautions and side effects, cystic acne has met its match in Accutane. People with severe nodular or cystic acne should always consult a dermatologist for the most appropriate treatment. For patients suffering from severe inflammatory acne that does not improve with traditional medication, a doctor may prescribe the retinoid isotretinoin or Accutane. This drug is taken by mouth, usually once or twice a day with food for a period of 15 to 20 weeks. Accutane has been shown to dramatically reduce the size of the patient’s oil glands within the skin. As a result, much less oil is produced, the growth of bacteria is decreased, and marked improvements in complexion will appear. Taking Accutane as a treatment for cystic acne is very effective since it can help reduce or prevent scarring. In patients who have been using Accutane for 15 to 20 weeks of treatment, 90 percent of those patients experience total, or almost total, clearing of acne breakouts. In some cases, patients find that their acne recurs after stopping the use of Accutane. The dermatologist may suggest another 15 to 20 week period of Accutane use or may prescribe other medicines. The use of Accutane can also have quite a significant downside. In pregnant women, isotretinoin can cause birth defects in any developing fetus. Women of childbearing age with cystic acne should be absolutely sure they are not pregnant and do not get pregnant while taking Accutane. Two separate effective forms of birth control should be used at the same time for a full month before treatment begins, during the entire course of treatment, and for another full month after stopping the drug. Even after the month has passed post-treatment, a woman should always ask her doctor when it is safe to get pregnant after they have stopped taking Accutane. Accutane can have some psychological effects as well. Cystic acne sufferers may become depressed by their appearance and the blemished state of their skin. Medicines like Accutane can actually intensify any existing depression, either during treatment or immediately following the prescribed course of the drug. If a person appears unusually sad or has other symptoms such as loss of appetite or trouble concentrating, a doctor should be consulted immediately. Other possible side effects include dry eyes, mouth, lips, nose, or skin; itching; nosebleeds; muscle aches; sensitivity to the sun; and, sometimes, poor night vision. Accutane can also increase blood triglycerides and cholesterol, or affect liver function. Side effects usually go away after the medicine is stopped. People with cystic acne often turn to Accutane for relief from a very upsetting condition. As long as they’re aware of some of its drawbacks and are vigilant about any physical or psychological symptoms, Accutane treatment can turn into a positive healing experience.